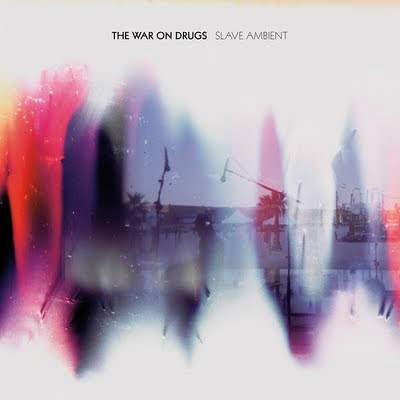 Philadelphia-based The War On Drugs' towering second full-length, Slave Ambient, is an agreeably loose (but emotionally prodigious) consortium of oasis and mirage. The so-called psych-Americana act's more formalized compositions are oasis, mappable destinations; soundscapes (like the roaring greyscale inferno "Original Slave") that form the firmament between are the mirage, beautiful, impossible to reach out and touch. All of it sits together as a series of supraliminal dreams you can't quite remember, just images that will spring to mind with surprising sharpness but questionable clarity. Which is to say that Slave Ambient doesn't communicate as a sequence of discrete riffs and lyrics, but as a holistic collage of awesome. This fuzzy presence is more pronounced on Slave Ambient than on on its terrific predecessor Wagonwheel Blues, as Drugs songwriter and fronter (and Dover, Mass. native) Adam Granduciel said in a recent interview that in writing and recording Slave Ambient he didn't really re-work lyrics, and in some instances recorded them in just a few takes long on improvisation. Adding to the slippery now that is this new collection is that a reel of music -- the eponymous slave ambient tracks -- was left to run in the background of the songs as they were mixed. Aurally there is a tension between the dense (and in places strong -- "Brothers" is loud, the rhythm tracks boom) wall of sound, and the fact that Slave Ambient's fever-dreamed construction can be quite delicate, a house of playing cards. Importantly, the record is best played very loud, as increased volume illuminates innumerable soft layers, renders the transparent diaphanous, and the diaphanous opaque, everything shifting in the 10-song set's deftly realized and fluid mix. Indeed, Granduciel said in still another recent interview that Slave Ambient was realized as much in the mix as it was in the writing and recording. Droning but buoyed by mechanistic rhythm tracks that mirror Mr. Granduciel's regimented but drawling streams of Beat-echoing free verse, "Your Love Is Calling My Name" serves as an able proxy for the 2011 sound of the Drugs. The aural motifs (tremeloed guitar, spectral "Walk Of Life" synth, apparitions of feedback in the final thrilling moments) pile up, not in a pejorative way, but in the same way that elements in certain David Lynch films iterate: the more they are presented, the less certain things become, the more pronounced the aesthetics and sheer beauty. Still, the music's ebb and flow produces recognizable touchstones. "Brothers" has something of Stevie Nicks' "Stand Back" in either the lyrical weft or warp, perhaps it is Granduciel's declaration "looking out the window of my room / I'm looking out where something once ran wild." "Come To The City" at times approximates U2's "Bad," right down to Granduciel's "woo hoo" mid-way through the song (as an aside, it makes one wonder whether Granduciel was a Philadelphian as far back as 1985, and also suggests The Edge's signature guitar playing as a significant precursor to The War On Drugs' repetitive layering). The preview track that's been out in the wilds of the Internet for some time, "Baby Missiles," is just classic Drugs: cold mecha-shuffle, streaming vocals stamped with slap-back, Dire Straits-styled synth. The affecting "Blackwater" beautifully closes the album: the acoustic guitars are laid bare, the leads shimmer. The song's biggest victory may be making the waltz time almost inapparent, but it is the line "Remember me when you dissolve in the rain" that sticks with you. Secretly Canadian released Slave Ambient Tuesday; the entire record can be streamed at SoundCloud right here. The War On Drugs' full-length debut Wagonwheel Blues was one of Clicky Clicky's top albums of 2008.